I would like to be made aware of certain situations and incidents such as natural disasters or infrastructure emergencies or even non-emergencies such as road closings. Is there a mailing list I can join in order to receive such bulletins? As a resident or business owner of Winchester, you are automatically signed up to receive emergency alerts and instructions by your listed home or business phone number. To sign up for non-emergency notifications (such as DPW announcements) or to customize how you receive notifications, you can follow the Citizen Alert icon on our homepage or click here. You will then be able to customize the types of notifications you receive and how you receive them. For example, you could choose to receive emergency notifications by home phone, cell phone, text message and email and non emergency notifications by email only. I have been involved in a motor vehicle crash. Do I have to report the accident and if so whom do I report to? Under certain circumstances, you are required to report a vehicle crash to the Registry of Motor Vehicles regardless of whether a police report was filed. You must report a crash if it has resulted in personal injury or death or vehicle/property damage which exceeds $1,000.Use the following form to report a crash:MA Crash Report. When stopped by a police officer for a motor vehicle violation, don't I have 24 hours to produce my license and registration? No, your license and registration must be with you while operating a motor vehicle. Sometimes I see drivers flashing their headlights to warn other drivers of police speed traps. Is this ok to do? It is not “normal operation” for a vehicles headlights to flash on and off, so you might be pulled over for a defective equipment violation. Ethically, you should keep in mind that the driver you are warning could be a drunk driver or other road menace that needs removing. I have expired medications at home. What is the safest way to dispose of them? Bring unused or expired prescription and over-the-counter medications to the Winchester Police Department for proper disposal. Disposal is available 24 hours a day. My neighbor's dog is constantly barking! It barks all day and all night! What can I do about it? Chapter 10 of Winchester’s By-laws state that “No person shall own or keep in this town any dog that bites, or by barking, howling, or in any other manner disturbs the peace or quiet of any neighborhood or endangers the safety of any person… It is the duty of the animal control officer to apprehend any such dog and impound it… or to order the owner thereof to restrain such dog.” If you you have such a complaint against a dog, contact animal control officer Jerry Smith at (781) 729 – 5151. If the complaint is not during regular business hours, contact the police department at (781) 729-1212. Please understand that just because an officer has the legal right to impound a barking dog does not mean that he or she automatically will. Cases are heard on an individual basis and discretion is used by officers. The By-law also prohibits unleashed dogs on public streets, ways, sidewalks, school yards, grounds, parks or private property of others without permission. The By-law also requires that owner’s clean up after their dogs. Help! There is a sick raccoon in my yard! How can I get rid of it? People often think that if certain animals, such as raccoons, must be sick if it is out during the day. This is not always the case. Often, it is very difficult to tell if an animal is sick or injured, though sometimes it is quite obvious. The most important thing to do when you encounter any wild animal on your property is to leave it alone. If you believe an animal is sick or injured, contact the animal control officer Jerry Smith at (781) 729 – 5151. If it is after hours, contact the police department at (781) 729-1212. An officer will respond and assess the situation and if necessary the animal will be euthanised. If you find a deceased animal on your property, wear heavy protective gloves or use a shovel to place it in a trash bag. Dispose of it at the transfer station. If you find a deceased animal on public property, contact the Department of Public Works at (781) 721-7100. Solicitors keep knocking on my door, trying to sell me magazine subscriptions or internet service. How can I make them stop? The Town of Winchester has not adopted a Solicitor By-Law therefore it is legal for a person to go door to door soliciting goods or services. 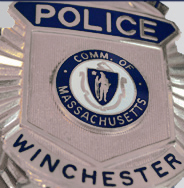 The Winchester Police Department does “request” that solicitors check in with the officer in charge of the station prior to beginning a campaign. We also “request” that solicitors refrain from soliciting door to door after dark. If you have no interest in speaking with a solicitor, you could post a “no solicitors or no trespassing” sign on your door. Keep in mind that in Massachusetts, trespassing may be arrestable but only in an officer’s presence. Often, solicitors use hard sales tactics and won’t take “no’ for an answer. If a solicitor refuses to leave your property when asked to do so, contact police immediately. If you decide to do business with a solicitor, there are a few things you can do to make sure they are legitmate and to stay safe. Don’t let them into your home. Ask to see an (ID, both their state ID/license – many are not from Massachusetts – and the one provided by their organization). If you still wish to do business, ask them to come back another day. Take that time to research their organization’s legitimacy online. If you are still interested, understand that you may get your magazine subscription, but your money spent may not be being used to “ help the solicitor through college” as promised but to turn a profit for the organization. Lastly, know the difference between a legitimate solicitor and a transient con artist. A transient may solicit a service, such as driveway resurfacing. While discussing the service with you, an accomplice may enter your home through a rear door and steal from you. A similar transient scheme is to promise a service for a certain price, do sub-par work and then demand additional payment for a problem encountered. If you ask a solicitor to leave your property, make sure they leave! Although each case has its own set of circumstances, law enforcement agencies must follow the activation criteria as closely as possible. There is enough descriptive information for law enforcement to believe an AMBER Alert will help locate the child. If all criteria are NOT met, the AMBER Alert Notification Plan should NOT be activated. The Plan should NOT be used for runaways. Also, while each case must be judged individually, most “child custody” situations DO NOT meet the criteria. Local law enforcement officers or members of the Massachusetts State Police must conduct an initial investigation to be certain whether or not the criteria for an activation of the AMBER Alert are met. Where the three criteria have been met, the chief or his/her designee may decide to submit an AMBER Alert Activation Request. The determination of who is authorized to submit such a Request is left to the local chief. In larger departments it may be delegated to the Commanding Officer or Shift Supervisor. In very small departments, where only one officer is on duty, and especially where no supervisor can be reached promptly, the decision may be left to the on-duty officer regardless of rank, if that is what the local Chief deems best. It is important for everyone to realize that if the system is overused, it will lose credibility and may result in reduced broadcaster participation. An Amber Alert Activation Request may be submitted verbally by phone to the Massachusetts State Police Communications Section (Comm Sec) or by calling and by faxing the completed Activation Request form to Comm Sec followed by a phone call to confirm they received the fax. Officers calling by phone should be prepared to furnish as much information shown on the form as possible and should promptly complete the fax and form as well. A recent photograph of the abducted child and the suspect, if available, should be obtained and forwarded to the State Police Communications Center, preferably in electronic format (especially if a scanner is available). Notify the requesting agency of his/her decision. Note: Where a request is denied, the police are still free to contact the media directly. In such cases the media may treat it as a news item or decide on a case basis to broaden the alert. The State Police Communications Section will work with the Massachusetts Emergency Management Agency to disseminate a broadcast (voice and/or text) over the Emergency Broadcast Network. This involves tape recording a message and sending it to two radio stations in Boston. The message is monitored by other stations and, after a series of such monitoring, it is picked up by stations across the state. Discussions are on-going, and the speed and manner of such dissemination may improve in time. Where an abduction takes place near a state border or where there is reason to believe the suspect will flee this state, consideration should be given to notifying the New England States Police Network (NESPN) so that police agencies in other states will be on the lookout for the parties. Stations that decide to do so will likely interrupt their regular broadcasting to air the Amber Alert. It is expected that this will take place every 30 minutes for the first 4 hours unless the Alert is terminated. Cable and television stations that decide to participate are more likely to broadcast a text message. The State Police Communications Section should be notified immediately when an abducted child is recovered or found. The Alert Activation Officer (Major) must take the appropriate steps to cancel the Alert and arrange to have the broadcasters so notified. An Amber Alert should only be issued for serious child abduction cases. It should not normally be used for runaway or parental-abduction cases, the two leading causes of missing children. The only cause for an alert under these circumstances would be if law enforcement believes the life of the child is in serious danger (e.g. if a parent threatened to harm the child and this information can be verified). Each case will need to be judged on an individual basis. Child is missing and particular consideration is given to their behavior or mental capacity in some way contributing to their disappearance. The child is also considered endangered. Child is abducted and there are witnesses to the crime. Child is missing and there is evidence of foul play, and law enforcement believes the child was abducted. Vehicle was stolen or “carjacked” and a child was left inside the vehicle. A 14-year-old girl is seen by neighbors returning to her home after school. Her father arrives home several hours later and determines the girl is not home. There is no sign of foul play, and a check with neighbors reveals that no one saw the girl leave, nor did anyone see anything unusual or suspicious at the residence. The police are called and further investigation reveals no information regarding the girl’s location. The girl returns home and it is discovered that she went shopping at the mall with a family friend and neglected to leave a note or tell anyone where she was going. Although the determination is made in hindsight, knowing that the girl had only gone shopping, an evaluation of the scenario reveals very little benefit that would have been derived from the broadcast of this case, other than a description of the girl and the clothing she was last seen wearing. There was no suspect description, no vehicle description and direction of travel. There was no sign of foul play, and the girl was certainly old enough to have gone somewhere of her own volition. This case would NOT qualify for an AMBER alert. Normal means of media involvement would still be available to aid in this investigation. A 21-month-old child is playing in his own yard, while his mother attends to chores in and around the house. The mother does not see her son in the yard. She then notices an unfamiliar vehicle parked near her driveway. As the mother exits the house the vehicle pulls away, and the child is not found. The police respond and conduct and area search, but the child is not found. Due to the age of the child and the mother’s ability to provide a description of the child and suspect vehicle, this scenario WOULD qualify for an AMBER alert. The ongoing investigation should, of course, include extensive area searches in the event the child had wandered a relatively far distance. Two children ages 3 and 5 are picked up by their father for weekend visitation. He is under court order to return the children to their mother at the end of the weekend but fails to appear. The mother calls police and they obtain information that the father is preparing to flee the country with the children. There is no history of inappropriate behavior by the father, and no indication that the children are in any danger. This scenario would NOT qualify for an AMBER alert. Although there is sufficient descriptive information available of the victims and the suspect, the suspect’s actions place him in violation of a custody order, and the children may be taken out of the country, there is no reason to believe the children are in imminent danger of serious bodily harm or death. The father of a 4-year-old girl arrives at her home in violation of an order of protection. He is highly intoxicated and removes the girl from the home in spite of the babysitter’s protests. He has been physically abusive to the child in the past, is despondant over his pending divorce, and makes comments to the sitter that if he cannot have custody of his child, no one will. He puts the child in his car and leaves at a high rate of speed. The police respond and a preliminary investigation, which includes interviewing other family members and checking numerous potential destinations, does not result in locating the suspect, nor are leads developed regarding his possible destination. This scenario WOULD qualify for an AMBER alert. Although this is a custodial situation, the father’s history of abuse against the child, his mental and physical condition, and the threats he has made lead the police to believe the girl is in imminent danger of serious bodily harm or death.